I think that one thing we can all agree on is the love of eating, we all have things that we love to eat. Sometimes our love affair with food isn't always the healthiest and Real Moms Love to Eat can help get you focused and headed down the right track. My current goal is to lose weight, be healthier and more active and to feel great about the way I feel and the way I look. Real Moms Love to Eat is the perfect book to help me reach my goals. Written by a mom for moms with friendly advice and tips that work in the real world! What helps motivate you and keep you focused? 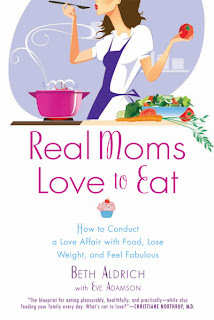 Real Moms Love to Eat is broken down in three sections, which include a fun and easy-to-follow 10-part plan for moms to implement to make gradual, life-long changes in their approach to food and 21 days of meal suggestions,tips, recipes and lifestyle changes—all to help you continue your love affair with food to look fabulous. Beth’s approach to healthy eating is simple and realistic for busy moms. You’ll learn a lot about the food you eat and how it impacts your body and still have loads of fun experiencing new foods and enjoying your life. Real Moms Love to Eat was created with you in mind. It will lead you on a food journey of excitement, fun and new surprises, without pigeon-holing you into one eating style or another. Instead, you are free to experiment, get crazy and become more open-minded about the food you will soon discover. It’s a love affair like no other–with huge rewards of looking fabulous. Real Moms Love to Eat will be your ONE source for tasty, fresh, whole food meals, creative recipes and food facts that will keep you looking fabulous and feeling energized and fulfilled. The book is written in a mom-to-mom conversational tone, with friendly advice and recommendations. It’s divided into three sections, which include a fun and easy-to-follow 10-part plan for moms to implement to make gradual, life-long changes in their approach to food and 21 days of meal suggestions, tips, recipes and lifestyle exercises—all to help you continue your love affair with food to look fabulous. Beth’s approach to healthy eating, losing weight and feeling fabulous, is simple and realistic for busy moms. You’ll learn a lot about the food you eat and how it impacts your body and still have loads of fun experiencing new foods and enjoying life. I wrote this blog post while participating in the SocialMoms and Beth Aldrich - Real Moms Love to Eat blogging program, for a chance to get 3,000 My SocialMoms Rewards points.